A Display to Demonstrate HotWires Performance This Counter-Top unit is the perfect sales tool to demonstrate the awesome performance of HotWires. 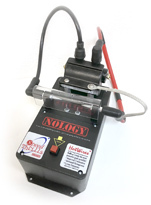 It compares the spark intencity of a standard high-performance ignition wire to a HotWire. A must-have for every retail store selling HotWires. As they say, "a picture speaks a thousand words".